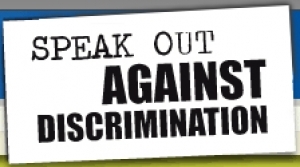 Spectacle was commissioned by the Council of Europe to make a public information video to support their campaign Speak Out Against Discrimination. This addresses discrimination arising out of racist attitudes and prejudice with the campaign slot as a call to action. The Glass Ceiling concept was a way to represent the invisible obstacles in society and our daily life. The people above the glass ceiling are oblivious and self involved, but someone falls below the glass and is immediately confronted with this issue. Together they make those still above the glass aware of this divide and are helped in breaking through the ceiling. The message: Anyone is vulnerable to discrimination, we as a society and as individuals are complicit if we overlook this and allow it to perpetuate. We all have the power to act and benefit from the diversity this brings. Click on the links below to view more information and video clips. CGI Sample: Climbing though the hole. You can follow the progress of our project The Glass Ceiling via this web page and through our blog.